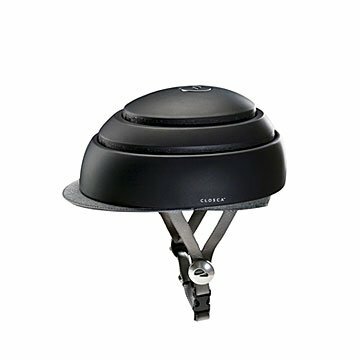 This sleek bike helmet collapses by more than 50% so you can stow it in your bag between rides. Imagine if everything you needed for your daily commute—from your laptop to your work shoes—could collapse in half. Meet this sleek bike helmet that stands up to the challenge. It folds up by more than 50% (show off! ), and stows neatly into your bag or backpack. Think of all those times you opted to drive or take the train because of your bulky bike gear. Not cool. Bonus: The helmet's subtle curve and matte black finish are modern and fashionable as opposed to those neon designs that feel more Tour de France than trip to the office. The helmet passed all its safety certifications, too, including the CSPC (US) and EN1078 (Europe). Also featuring built in NFC safety technology, the helmet links to your smartphone so you can travel in safety and confidence. With one touch on your smartphone, you can alert anyone of your whereabouts if there's a road side emergency. It's a thoughtful gift for cycling companions, big city dwellers, or loved ones who are always wheeling off on a new adventure. Designed in Valencia, Spain. Made in China. Great design, comfortable, and practical.